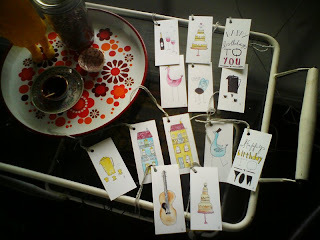 I've made some handmade gift tags over the last couple of days. Each one is hand drawn and painted with watercolours. I've asked Lynne from Hello Again to put them in her shop to see how they do. They're like mini original works of art! I'm trying to eliminate printers from my life, they're full of hassles. You are one talented lady! Thanks for the comment on GG. I listened to your myspace earlier today. Beautiful! those look great. nice tray too. i'm sure it was hard for you to give it up! !